3D printing is a method of rapid prototyping for making plastic prototypes from CAD models. 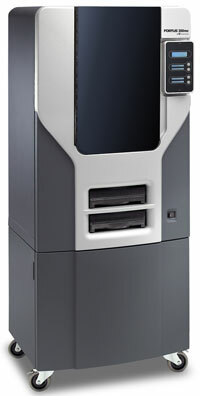 The printers can easily and fairly rapidly create 3D models from computer files created using SolidWorks®, IronCAD®, or virtually any other 3D rendering suite. Before you use the 3D printer, there are several things to consider. Please read all of these if you intend to use the 3D printer.  A *NEW* Maker Bar is open and ready to use! It is located near the OEDK stairwell on main floor. This are self-service printers and are open to use by any OEDK registered user. More information and training material coming soon. For more information about each 3D Printer's capability is below. 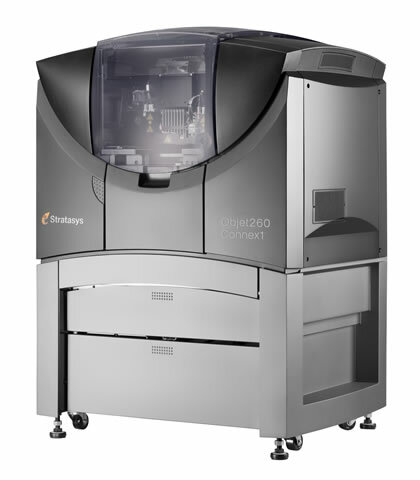 For information on how to use 3D Printers go to our Equipment Training Modules. Resolutions Possible 0.0006" (High Quality), 0.001"
Resolutions Possible 0.001", 0.002", 0.004"
Post-Processing Method Required Isopropyl Alcohol Rinse & Soak (10 minutes). Possible Additional Water/UV Soak. Create an .stl file using SolidWorks®, IronCAD®, or virtually any other 3-D rendering suite. The file you need in order to operate the 3-D printer is an .stl file. If you come with another file type, you will not be able to print. You can convert IronCAD and SolidWorks files into .stl files within the program. To print a model you will need an STL file (.stl). There are a few open-source 3D design programs that can save or export in this format such as Sketchup Make, AutoCAD’s 123D, TinkerCAD and Blender. To start with, there is a $5.00 processing charge for use of the plastic base and sodium hydroxide bath. On top of that, the cost is approximately 8.00 per cubic inch, including support material, depending on which printer you use. If you can afford the cost of printing, please come with a fund and organization number. You should receive these numbers when you begin design, or from your advisor. Although you do not have to pay for time on the machine, printing parts can take hours. If you are planning on printing a part, contact an OEDK technician for availability of the machine. ALL PRINT JOB FILES MUST BE REVIEWED by you with an OEDK design technicinan prior to the job being run. It is crucial to catch any errors in the file before printing so not to waste materials and time. Printing is started between the hours of 8:30am and 3:00pm. You can expect at least one day of processing time prior to the commencement of printing. The printer also is operated on a first come, first served basis. You can expect a minimum of one day processing time prior to the commencement of printing. Many of the parts that you may think you need to print are available for purchase for much cheaper. A box that costs $60 to print may be available at an electronics vendor for $3. These boxes will be stronger, more consistent, and easier to obtain, so this course of action is recommended if possible. If you do decide that you need to print a custom part there are several more items to consider.